Legal consumers conduct millions of web searches every month. In fact, nearly half of all legal consumers initiate their search for a law firm by using online resources, and 74 percent of them intend to take action when they do so1. Yet for many attorneys, prospective clients aren’t even finding their websites. Hidden among a plethora of competitors and other legal sites, your firm can easily be lost in the crowd without appropriate optimization. That’s where pay-per-click advertising for lawyers comes in. Pay-per-click advertising, or PPC marketing services, is an internet marketing model wherein businesses or individuals pay a fee every time a viewer clicks their online ad. PPC allows such businesses to become advertisers, of sorts. They’re enabled to display ads for their goods or services when consumers enter relevant search inquiries into search engines. Advertisers pay only when a user actually clicks on their ad. PPC advertising is effective because digital real estate is valuable. Consider this: If you want a commercial to appear on television, you pay for that spot. If you want a print ad to appear in the newspaper, you have to pay for that, too. Internet advertising works the same way. Some websites offer premium space for online marketers, including law firms. In order to promote your brand or services in those locales, you have to pay. While both traditional and digital means of marketing serve a distinct purpose, recognizing their differences can be useful. For example, one of the benefits2 of pay-per-click advertising results from its cost structure. That is, advertisers pay per click versus per eyeball, ensuring at least some viewer engagement before triggering fees. In this way, digital marketing can be more cost-effective, because it’s scalable to a fixed budget amount as opposed to traditional advertising’s flat-fee rates. Now, PPC advertising only brings consumers to your landing page, but that’s just the tip of the iceberg. You want more than simply visits to your landing page: You want conversions – paying clients – to come knocking. To achieve that goal, you need to understand your options. Although PPC advertising comes in many forms, the two most common types are paid search campaigns where advertisers bid on certain keywords and display ad networks. Paid search campaigns rely on search engines, such as Google and Bing, to distribute the ads to viewers. The advertiser selects and bids on keywords. When someone searches for those keywords, your ad may show up depending on several factors outlined below. If the person clicks on your ad, they’re taken to your landing page and you’re charged for the pay-per-click service. Given the sheer preponderance of keywords like “lawyer,” “attorney” and “criminal defense law firm” in legal consumers’ search queries, people in the legal industry tend to pay the highest price in PPC management fees. Display ad networks are websites to which many consumers go when they want to find a large selection of sellers. Shoppers look at the different sellers and make comparisons based on the profiles and ads presented. As with paid search campaigns, display ads charge whenever someone clicks on your ad. Although you’ll find myriad advertising opportunities online, some of the most lucrative for attorneys are social media, and legal directory networks ( like the FindLaw Lawyer Directory). Promoting Your Firm With Pay-per-click provides attorneys with a basic overview of PPC. This playbook will reveal just what goes into a PPC campaign and what law firms need to understand and consider when bringing PPC advertising into their marketing plan. When law firms choose to target the same keywords with PPC that they’re already ranking well for organically, they’re using the “supplementary” strategy – learn more about this strategy here. Schedule an appointment with a local market expert to discuss pay per click and how it can be an integral part of your firms’ marketing strategy! Despite the allure of pay-per-click pricing, it can become expensive fast if it’s mismanaged. Although advertisers set their own campaign budget, it’s easy to fall into the trap of chasing expensive keywords or increasing your budget frequently. Taken individually, small changes to your budget or adjustments to your campaign strategy may not seem important. Viewed as a whole, and against your overall return on investment, the nickels and dimes start to add up. According to Hochman Consultants3, at a click-through rate of 1.16 percent the average cost per click in 2016 was $2.14. Of those clicks, approximately 6.5 percent resulted in sales, leaving the typical cost of a conversion around $33. Obviously, your mileage may vary based on your market, your strategy and your savvy. Because so much of Google AdWords’ automated advertising platform relies on historical data to accurately price ads and place them in front of the consumers most likely to click, a good PPC manager handling a new campaign requires a great deal of patience and continued optimization while that search data history grows. For the beginning campaign, the system determines an ad’s search performance based not on history but only on targeted keywords, landing-page quality and ad copy. The system both rewards advertisers who have better click-through rates and assumes new campaigns will achieve moderate success. So, when selecting a vendor, be sure to choose someone who understands this strategy. Essentially, all PPC campaigns need to be ramped up. As mentioned earlier, Google needs historical data to evaluate the campaign’s expected performance. Until then, your campaign will have a fair amount of early-stage variability that your savvy PPC strategist will actively, and patiently, manage. Legal consumers don’t think and act like lawyers. In other words, something that makes sense to you may not make sense to your prospects. So, managing your own PPC campaign could cause you to target irrelevant keywords or craft faulty PPC ads. That’s why you need a vendor who’s familiar with what legal consumers look for, and who has conducted enough pay-per-click analysis to provide you with appropriate direction. An effective vendor knows the audience and they know PPC. They use that background knowledge along with ongoing evaluation to optimize your campaign rather than making a good guess and letting it sit idle. FindLaw knows legal consumers better than anyone else. Their network of legal directories and attorney clients across the country provide them a perspective into what legal consumers are searching for, and how lawyers can position themselves most effectively. Lots of attorneys dip their toes into pay-per-click advertising only to pull away after being burned by disappointing results. They underestimate the complexity behind these small ads and wind up losing money and time on campaigns that barely make it off the ground. The truth of the matter is that PPC advertising is far more sophisticated than most attorneys realize. Successful campaigns typically require extensive industry knowledge, keyword research and ongoing analysis to maximize your firm’s budget and achieve a positive ROI. If it sounds a lot more complicated than a phone book ad, that’s because it is complicated. But it’s also far more targeted and powerful than previous forms of advertising ever were. Hiring strong experience in this field can mean the difference of thousands of dollars to an attorney looking to generate clients. One way to ensure your choice is to look at the vendor’s accreditation. FindLaw is a Premier Google Partner, which means that everyone at FindLaw who works on a PPC campaign is Google AdWords certified and has the training and experience to help you develop a strong local PPC strategy. What is the PPC cost? What is their PPC management fee? How are their fees calculated? What are your potential costs and ROI over time? How transparent are they about reporting? Keyword targeting? Other practices? What is PPC strategy, and how will it help me? Since you paid for the service, you automatically retain ownership over the materials generated, right? Not so fast. Though clients typically expect that if they fire an advertising agency they’ll keep all the creative copy, more often they’re unpleasantly surprised finding out they must start from scratch when they opt for a different provider. Fortunately, FindLaw leans the opposite way: Law firms own their AdWords account and retain full rights of ownership. By giving up your content, you’d not only lose creative assets, you’d also sacrifice resale rights4 to an agency who can sell your content and the associated historical data that goes with it. By now, you’re likely aware of the importance of this historical data. To be sure, you waited and earned the rights to the underpinning factor that determines ad pricing and placement. In other words, you likely want to work with a vendor who believes in your complete administrative ownership over your PPC marketing services. When attorneys seek out pay-per-click management, they are best served when they find a vendor who is intimately familiar with the nuances of PPC advertising. They should consider the strategy that goes into building an effective PPC campaign and choose an agency that will help them adhere to that strategy. FindLaw’s PPC strategists know how to develop a strong strategy for continuous performance and improvement. We have a systematic approach in place and highly skilled personnel who focus on driving consistent performance and maximizing budget. Their goal is to continue garnering results for you even after the quick and easy consumers are found. As stated earlier, many agencies are only concerned with the number of clicks your law firm receives, with minimal attention paid to actual conversions. That approach does little to nurture your business. FindLaw focuses not just on getting clicks to your landing page but also on converting those clicks at the highest rate possible so that clicks turn into conversions. Just as some companies would try to sell you a bridge to Hawaii if it meant more profit for them, you can be sure that some unsavory PPC vendors will promise you the moon in unrealistic results if it means getting your business. As such, it’s wise to consider what constitutes realistic outcomes before approaching a PPC agency for services. Your target search niche is so small or so new that no one’s searching for your service. You haven’t analyzed what your competition is doing. Your website isn’t prepared to make effective use of the traffic you’ll be receiving. Be sure that you’re being honest with prospective vendors and with yourself. If you need to change direction, don’t be afraid to do so. Make sure that there’s solid grounding for any promises made during the “interviewing” stage. Ask for evidence, if in doubt. When choosing FindLaw as your pay-per-click consultants, you can feel confident you’re working with an expert in the field. FindLaw is a Premier Google Partner, with more than 57 AdWords-certified campaign strategists. We help you target paying clients effectively and efficiently so that you can focus on your other obligations. We provide an exceptional pay-per-click service and help you wade through complicated PPC definitions so that you know exactly what you’re buying. Pay-per-click marketing tools serve as a piece of your marketing puzzle. Invest in this service when it makes sense, but also consider that a well-rounded, integrated approach balancing PPC with organic SEO or other marketing strategies is a better bet for most law firms. FindLaw can help you find that sweet spot so you optimize your exposure and dollars while minimizing wasted time and effort. PPC is often viewed as simply a short-term strategy that can be put into place and then ignored. But the truth is that similar to your law firm’s website or blog, you don’t build out a PPC campaign with the intention to set it and forget it. You have to continuously run and maintain it in order to receive ongoing value. Whether you’re currently doing PPC advertising or you are interested in trying it out, it’s important to understand why a value-driver like PPC is most effective when utilized as a core component of your overall marketing strategy. Pay-per-click management tools grant you high visibility and targeted messaging. They allow you to focus on a specific service you offer and generate interest among clients who seek that service. For instance, although you may focus on other practice areas, such as divorce and domestic partnership, if you include the keyword “adoptions” in your PPC strategy and a user searches for “out of country adoptions,” your firm will appear in the search listings. Having this additional keyword out there can bring in new clientele. FindLaw helps you recognize those niche areas that can bring more business to your law firm. The majority of law firms lack a strong brand presence. That is to say, most attorneys don’t have a great deal of name recognition, giving pay-per-click advertising another way to support your firm and brand. While such marketing serves as an effective way to retain dominance in your market, it also allows you to reinforce your brand’s name and identity for a relatively low cost. Ads can be customized to deliver your specific message, and for limited expense, given that there likely isn’t much competition for your firm’s name. There may be times when you want specific leads for your law firm or you have special offers for a certain segment of the population. FindLaw can help you generate ads geared to them. For instance, perhaps you’ve brought in a partner who specializes in DUI defense; as such, you want to create brand awareness of this new service. We can identify the common keywords searched by legal consumers looking for DUI representation, and the verbiage that garners clicks. Further, if your firm wants to highlight a unique opportunity, such as a complimentary consultation, we can craft an advertisement around that promotion, for that target population. PPC is a core component of any truly holistic online marketing strategy, but your advertising campaigns only deliver results when they’re active. 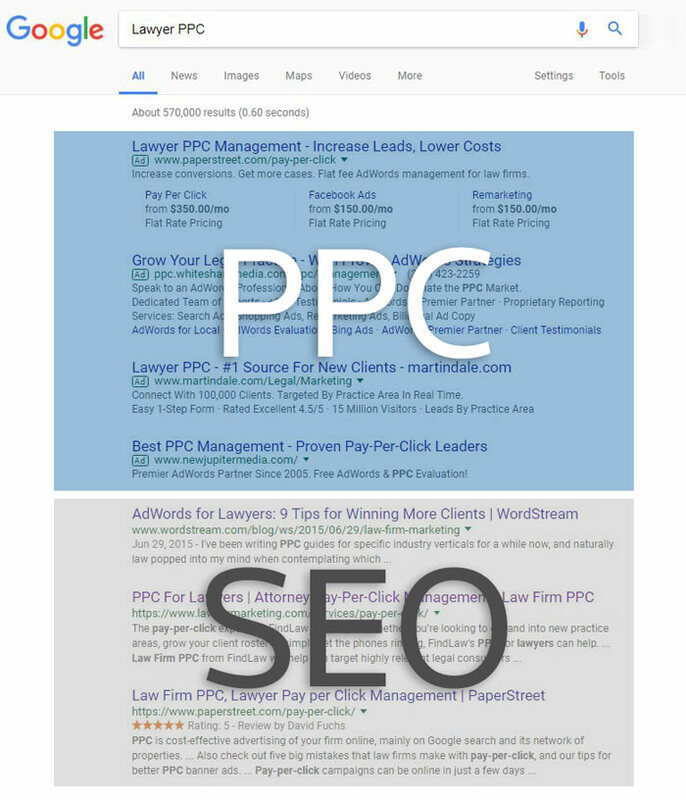 To be most effective, you should expect PPC to be an ongoing expense. This requires a degree of trust that your campaign is being managed effectively. For FindLaw customers, that trust is established by regular, transparent reporting. Our attorney clients receive monthly reports on their performance and are able to access their own dashboard any time.